Bijou arrived in Australia in May 2009 after Amanda Young purchased the gelding in New Zealand. He is an accomplished 3* eventer with a 5th place in the World Cup Qualifier at Kihikihi in 2008. Aka Willy, he stands at a mighty 15.2hh. Willy settled in well at Copabella and commenced his Australian career with a bang. 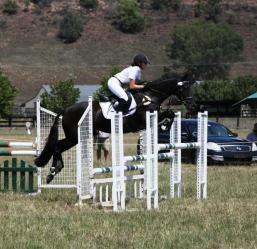 He notched up 73% in his first dressage start in June, and placed 8th in his first Pre-Novice start at SIEC in July. Willy has since had wins and places at 1* level with Amanda, as well as earlier placings at Pre-Novice. And now after a short but very successful run with Emma Mason up to 2* while Amanda was getting her affairs in order, Willy has moved to Tamworth to begin a new life in the country. We wish them well.